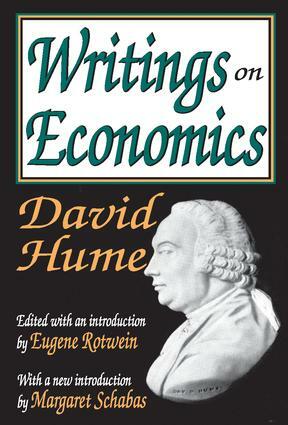 Originally published in 1955, Eugene Rotwein's collection of David Hume's economic writings has become the criterion by which to measure studies of Hume's thinking on economics. Rotwein, in his extended introduction, masterfully examines the connection between Hume's various writings—economic, political, philosophical, and historical. This edition is graced with a new introduction by Margaret Schabas. Hume belonged to the same generation as that of his friend and fellow countryman Adam Smith. Hume's writings on economics, however, unlike those of Smith's, comprise a relatively small portion of his published works. They consist of nine of twelve essays in his Political Discourses, first published in 1752, and a rather small number of passages in Hume's private letters to such correspondents as Smith, Montesquieu, Turgot, and Oswald. They were all brought together here for the first time in a single volume. These writings sought to clarify the various problems of Hume's society and suggest remedies for their solution. They are still relevant for the modern reader. Included are "Of Commerce," "Of Refinement in the Arts," "Of Money," "Of Interest," "Of the Balance of Trade," "Of the Jealousy of Trade," "Of Taxes," "Of Public Credit," and "Of the Populousness of Ancient Nations," as well as the relevant extracts from Hume's letters. Long unavailable, this edition will be welcomed by students of economics, philosophy, and the Scottish Enlightenment.